Delta people, customers and their friends and family members from across the globe demonstrated their commitment to eradicating breast cancer by raising an unprecedented $2 million for the Breast Cancer Research Foundation during the airline's 2017 campaign, which took place last October. Delta leaders and employees presented BCRF with the donation at its annual Hot Pink Party at the Park Avenue Armory in New York City Thursday night. This year's donation exceeded the airline's 2016 donation by $200,000. Since 2005, Delta employees, customers and their friends and families have raised $14.6 million for BCRF, including last year's efforts of $1.8 million. The collective contributions have funded the vital work of 51 different research projects over the years in the pursuit of eradicating breast cancer. "Every single year I am blown away by the commitment of our employees and customers to come together to support BCRF and its mission of finding a cure," said Allison Ausband, Senior Vice President — In-Flight Service. "At Delta, giving back is in our DNA, and BCRF is just another way we support each other, and the local communities where Delta people live, work and serve." Delta's month-long campaign to raise awareness and funds for breast cancer research kicked off with the airline's 13th annual "Breast Cancer One" employee survivor flight, which carried more than 140 breast cancer survivors on board the airline's iconic pink plane from Atlanta to Seattle. Throughout the campaign, Delta employees donned pink uniforms and sold pink products, including pink lemonade and pink headsets, on board and in Delta Sky Clubs. The airline also set up Pink Boutiques across the system where Delta people could contribute to the campaign by purchasing BCRF merchandise. In addition, employees and customers were able to donate on Delta's BCRF website as well as on board flights. Interested customers and employees are also able to donate to BCRF year-round on delta.com and through SkyWish, the charitable arm of Delta's SkyMiles frequent flyer program that allows Delta and its SkyMiles members to donate miles to charitable organizations worldwide. Shifting focus to the 2018 campaign, the airline is already prepping for this year's fundraising efforts, donating all sales over the Mother's Day weekend to BCRF. Flight attendants also donned their pink dresses as well as other pink accessories such as pocket squares, ties and aprons, to celebrate the fundraising event. Delta will continue the legacy of the pink dress with the launch of its new Zac Posen uniform collection May 29. Last year, Delta and Zac Posen pulled back the curtain on his newly-designed pink dress, which will be seen in airports around the world this October. The new design will be joined by five other pink uniform pieces. 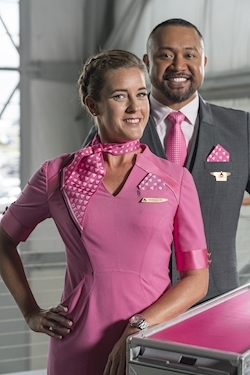 Customer service agents and flight attendants will have pink options like Posen's V-Neck Dress, female scarf, male and female pocket squares, and men's ties; below-wing employees, like technicians and ramp agents, will sport pink hats. BCRF is a nonprofit organization committed to achieving prevention and a cure for breast cancer. BCRF provides critical funding for cancer research worldwide to fuel advances in tumor biology, genetics, prevention, treatment, metastasis and survivorship. Since its founding in 1993 by Evelyn H. Lauder, BCRF has raised more than half a billion dollars for lifesaving research. In 2017-2018, BCRF will award $59.5 million in annual grants to more than 275 scientists from top universities and medical institutions around the globe.